West Virginia University (WVU) is a public research university in Morgantown , West Virginia , USA . Other campuses include: West Virginia University at Parkersburg in Parkersburg ; West Virginia University Institute of Technology in Montgomery ; Potomac State College of West Virginia University in Keyser ; and a second clinical campus for the University's medical and dental schools at Charleston Area Medical Center in Charleston . Since 2001, WVU has been governed by the West Virginia University Board of Governors. Enrollment for the fall 2007 semester was 28,113. The University offers 185 majors in 15 colleges and has produced 25 Rhodes Scholars, including former WVU president David C. Hardesty Jr. The University also has produced 30 Goldwater Scholars, 19 Truman Scholars, five members of USA Today 's All-USA College Academic First Team, and two Morris K. Udall Undergraduate Scholarship winners. WVU is ranked by The Princeton Review as one of the best 368 colleges in the nation. Woodburn Hall is one of the oldest buildings at West Virginia University and has long since been a symbol of the university. Nearby Martin Hall, home of the School of Journalism is the University's oldest building. Under the terms of the 1862 Morrill Land-Grant Colleges Act, the West Virginia Legislature created the Agricultural College of West Virginia on February 7, 1867. On December 4, 1868, lawmakers re-named it West Virginia University. In the 1990s, WVU developed several recreational activities for the students, such as FallFest, a concert that welcomes students back to classes. In 1998, WVUp All Night launched to offer free weekend entertainment to students. The popular Student Recreation Center was completed in July 2001. WVU is designated as a Research University (High Research Activity) by the Carnegie Foundation for the Advancement of Teaching. Funding from external sources for total sponsored programs is $138 million. WVU is affiliated with the Blanchette Rockefeller Neurosciences Institute, dedicated to the study of Alzheimer's and other diseases that affect the brain. WVU is also a leader in biometric technology research and recently became the Federal Bureau of Investigation's lead academic partner in biometrics research. On April 13, 2007, the Board of Governors voted 16-1 to elect Morgantown attorney Michael Garrison to succeed David Hardesty as the University's president. The Faculty Senate voted to work with Garrison but approved a vote of no confidence in the search. Garrison began work in July; his appointment officially began September 1, 2007. Garrison's early initiatives, including move forward to build a campus child care center after three decades of discussion on the subject and working with the Board of Governors to approve the largest salary increase since 1993 won him praise from many faculty and staff members. The Chronicle of Higher Education and Inside Higher Ed profiled him as an example of a trend toward non-traditional university presidents. In June 2008 Garrison announced plans to resign in September 2008. According to the Washington Post, Garrison sought to "end a scandal stemming from the university's awarding of an unearned degree to the governor's daughter." C. Peter McGrath was named interim president in August 2008. James P. Clements became WVU's 23rd president on June 30, 2009. He previously served as provost at Towson University. On September 16, 2009 Michele G. Wheatly was named Provost and Vice President for Academic Affairs. WVU has been listed as one of the top party schools in the United States. Eberly College of Arts of Sciences was officially established in 1895. It is home to many academic disciplines including: social and behavioral sciences, literature and the humanities, as well as mathematics and natural resources. It is the largest and most diverse college at WVU. In addition to its 15 colleges and schools, WVU also has a nationally recognized forensic science program. Originally created through a partnership with the Federal Bureau of Investigation , the program is accredited by the American Academy of Forensic Sciences and is the official library holdings repository for the International Association for Identification. Forensic facilities include "crime-scene" houses and vehicles that can be altered and adapted to give students hands-on experience, as well as traditional laboratories and classrooms which are now housed in the recently renovated Ming Hsieh Hall adjacent to Oglebay Hall. A separate Criminology & Investigative Sciences major was later added. West Virginia University was the first in the world to establish a bachelor of science degree in Biometric Systems. In 2003 the university also founded the initial chapter of the Student Society for the Advancement of Biometrics(SSAB). The program, located in the Lane Department of Computer Science and Electrical Engineering (LCSEE), provides a firm understanding of the underlying electrical engineering and computer engineering disciplines that support biometric applications. On February 6, 2008, WVU became the national academic leader for the FBI 's biometric research.WVU is also the founding site for the Center for Identification Technology Research (CITeR), focusing on biometrics and identification technology. The university maintains and develops collaborative relationships with other academic institutions to meet research needs. West Virginia University’s Robert C. Byrd Health Sciences Center is located on the Evansdale Campus and houses the Schools of Dentistry, Medicine, Nursing, and Pharmacy. These schools grant doctoral and professional degrees in 16 different fields, as well as a variety of other Master's and Bachelor's degrees. For 2009, U.S. News and World Report ranked WVU’s Medical School ninth overall in the nation for rural medicine. Also located on the Health Sciences Campus is WVU's local teaching hospital, Ruby Memorial Hospital, which is one of only two designated Trauma I hospitals in the state and has also been designated a magnet hospital for its ability to attract and retain high quality nursing staff. The University maintains seven libraries on its campuses (six of which are in Morgantown and the other in Charleston). These include the Downtown Campus Library, Evansdale Library, Health Sciences Library, Law Library, Math Library, Media Services, and the WVU Charleston Health Sciences Library. Collections include the Appalachian Collection, Book Depository, Digital Collections, Government Documents, West Virginia Historical Art Collection, Map Room, Myers Collection, Patent and Trademarks, Rare Books Collections, and Theses and Dissertations. West Virginia University libraries contain nearly 1.5 million printed volumes, 2.3 million microforms, more than 10,000 electronic journals, and computers with high speed Internet access. In addition, the West Virginia and Regional History Collection, the world's largest collection of West Virginia related research material, is in the Wise Library on the Downtown Campus. According to the university, the collection includes over 4,500,000 manuscript documents, 30,000 books, 15,000 pamphlets, 1,200 newspapers, 100,000 photographs and prints, 5,000 maps, and 25,000 microfilms, oral histories, films and folk music recordings. It is often called simply the "West Virginia Collection." 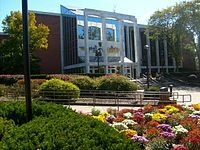 In 2007, the Princeton Review ranked West Virginia University libraries 5th best of 366 college libraries surveyed. The university co-publishes, with the United Association for Labor Education, Labor Studies Journal. The Morgantown campus comprises three sub-campuses. The original main campus, typically called the Downtown Campus, is in the Monongahela River valley on the fringes of Morgantown. This part of campus includes eight academic buildings on the National Register of Historic Places. The Downtown Campus comprises several architectural styles predominantly featuring red brick including Victorian Second Empire, Federal, Neoclassical, and Collegiate Gothic among others. The Evansdale Campus, a mile and a half north-northwest, on a rise above the flood plain of the Monongahela River, was developed in the 1950s and 1960s to accommodate a growing student population, since space for expansion was limited at the Downtown Campus. The Health Sciences Campus, in the same outlying area (but on the other side of a ridge), includes the WVU Health Sciences Center, Ruby Memorial Hospital, Chestnut Ridge Hospital, Mary Babb Randolph Cancer Center, UHA Physicians Office Center, Blanchette Rockefeller Neurosciences Institute and, WVU Eye Institute, WVU Center on Aging, and WVU Children's Hospital. The Health Sciences Campus is located near Mountaineer Field , over a ridge from the Evansdale Campus. Because of WVU's distributed campuses (Downtown, Evansdale, and Health Sciences), the Personal Rapid Transit system, which has become a local showpiece, was built to link them. Boeing began construction on the Personal Rapid Transit (PRT) system in Morgantown, West Virginia in 1972. The unique aspect that makes the system "personal" is that a rider can tell the system which station is the destination and then he/she will be directed to a car that is bound only for that station. WVU students, faculty and staff ride by paying a per-semester fee; they swipe their magnetically-encoded ID cards through the turnstiles when entering the stations. Others pay a cash fare of $0.50. The PRT began operation in 1973, with U.S. President Richard Nixon's daughter, Tricia, aboard one of five prototype cars for a demonstration ride.. The PRT handles 16,000 riders per day (as of 2005) and uses approximately 70 cars. The system has of guideway track and five stations: Walnut, Beechurst, Engineering, Towers, and Medical/Health Sciences. The vehicles are rubber-tired, but the cars have constant contact with a separate electrified rail. Steam heating keeps the elevated guideway free of snow and ice. Although most students use the PRT, this technology has not been replicated at other sites for various reasons, including the high cost of maintaining the heated track system in winter. The National Society of Professional Engineers named the WVU PRT one of the top 10 engineering achievements of 1972, and in 1998 The New Electric Railway Journal picked the WVU PRT as the best people mover. In 2006, the U.S. Department of Transportation and U.S. Environmental Protection Agency dubbed WVU one of the best workplaces for commuters. In addition to the PRT system, students can utilize University-operated buses (during limited hours) or take advantage of the community's Mountain Line, which operates every day into the early morning hours. Students can use their Mountaineer Card to ride the Mountain Line bus for free. The Health Science Center also operates a shuttle service to help students, visitors and patients to get to and from the Health Science Center campus. Many non-University, private student housing communities in the area also operate a shuttle to campus/town and back to the housing community. About 10-15 percent of West Virginia's students are involved in Greek life. Many of the fraternity houses are on North High Street, North Spruce Street, and Belmar Avenue while sorority houses are mainly on Spruce Street and Prospect Street. According to the University, there are 17 fraternities and 8 sororities at WVU. Following is a list of those that belong to the Inter-Fraternity Council and the National Panhellenic Conference (sororities). In recent years, many of the houses, as noted on the list, have been closed or condemned for various reasons. Recently, the University began purchasing some of the fraternity houses near campus, which is a beginning step in a multi-year plan that eventually will leave the University in control of many of the Greek organizations. The plan has both pros and cons. The Greek organizations who are finding it increasingly difficult to maintain their houses according to Morgantown City Code are getting the repairs and financial support they need. In return, the University is able to govern their behavior, which has long been a problem for the University. The Daily Athenaeum, nicknamed the DA, is the 9th-largest newspaper in West Virginia. Offered free around campus, it generates income through advertisements and student fees. The paper began in 1887 as a weekly literary magazine, with writing, editing and production taken over by the newly formed School of Journalism in the 1920s. In 1970, the paper split from the School of Journalism and became an independent campus entity governed by the Student Publications Board. The DA was voted as the Princeton Review's 10th-best college newspaper in the United States in 2005, 15th in 2006, and 8th in 2007. The Daily Athenaeum is an affiliate of UWIRE , which distributes and promotes its content to their network. WWVU-FM, called U92 or The Moose, plays new music, talkshows, and newscasts. On the air since 1982, U92 can be heard in the Morgantown area at 91.7 FM and also streams live on the internet. In 2007, the station was one of four college radio stations nominated for College Music Journal's Station of the Year Award. The Mountaineer Maniacs student section perform the first down cheer at a home football game. The school's sports teams are called the Mountaineers and compete in the Big East Conference, a member of the NCAA's Division I. The school has teams in 17 college sports and has won several national championships, including 14 NCAA Rifle Championships as of 2009.
Notable athletes from West Virginia University include Stan "The Man" Boskovich, Jerry West, Jim Braxton, Marc Bulger, Avon Cobourne, Mike Compton, Noel Devine, Cecil Doggette, Mike Gansey, Major Harris, Chris Henry, Joe Herber, Jeff Hostetler, Chuck Howley, Sam Huff, Darryl Talley, "Hot Rod" Hundley, Adam "Pacman" Jones, Joe Stydahar, Dan Mozes, Kevin Pittsnogle, Jerry Porter, Todd Sauerbrun, Steve Slaton, Rod Thorn, Mike Vanderjagt, Jerry West, Pat White, Quincy Wilson, and Amos Zereoue; wrestlers Nate Carr, Greg Jones, Mike Mason, Joe Alexander, Owen Schmitt, and Georgann Wells, the first female player to register a dunk in a collegiate basketball game. West Virginia University's logo is known as the "Flying WV." It debuted in 1980 as a part of a football uniform redesign by Coach Don Nehlen. It was adopted as the official logo for the University in 1983. The Mountaineer was adopted in 1890 as the official school mascot and unofficially began appearing at sporting events in 1927. The new Mountaineer is selected each year by the Mountain Honorary during the final two men's home basketball games. Candidates must have at least a 2.5 GPA, write an essay about why they want to be the Mountaineer, attend an extensive interview process and garner the most cheers during the home basketball game. The successful candidate is awarded the formal title of "The Mountaineer of West Virginia University." Although men typically are chosen, there have been two women selected (Natalie Tennant, who is now the West Virginia Secretary of State) and Rebecca Durst. The new Mountaineer receives a scholarship, a tailor-made buckskin suit with coonskin hat, and a period rifle and powder horn for discharging when appropriate and safe. The mascot travels with most sports teams throughout the academic year. There is always a backup Mountaineer to step in when needed. The John Denver song "Take Me Home, Country Roads" is commonly played at most home sporting events as well as other occasions on campus. In 1980, Denver helped dedicate the new Mountaineer Field, and performed the song as a sing-along with the crowd. It then became a tradition, after a victory, for fans to stay in the stands and sing it along with the football team. The West Virginia University Mountaineer Marching Band, nicknamed "The Pride of West Virginia," was formed in 1901 as an all-male ROTC band. It performs at every home football game and makes other appearances on- and off-campus throughout the year. On April 24, 2008, the Pittsburgh Post-Gazette reported that the university had improperly granted an MBA degree to Heather Bresch, the daughter of the state's governor Joe Manchin and an employee of Mylan, the university's largest donor. In the resulting aftermath, the University determined that Bresch's degree had been awarded without having the prerequisite requirements met and rescinded it. This led to the resignation of president Michael Garrison, provost Gerald Lang, and business school dean Steve Sears. WVU.edu: Board of Governors - "Powers & Duties"
Doherty, William T. Jr. and Festus P. Summers. (1982) West Virginia University: Symbol of Unity in a Sectionalized State. Morgantown, West Virginia: West Virginia University Press, page 8. Doherty, William T. Jr. and Festus P. Summers. (1982) West Virginia University: Symbol of Unity in a Sectionalized State. Morgantown, West Virginia: West Virginia University Press, page 11. The Charleston Gazette (July 18, 2007): "WVU governors speed up takeover date for president"
"The Lobbyist as President," by Paul Fain, Chronicle of Higher Education, February 15, 2008. "WVU's 23rd president officially takes reins"
"Wheatly named Provost at WVU"
WVU News and Information Services (July 13, 2004 press release): "WVU PRT Station to Bear Name of People-Mover's Creator"
Sports Illustrated (month n.a., 2006): "102 More Things You Gotta Do Before You Graduate"